Some 800 million years ago, receding glaciers carved out a unique landscape covering approximately 8 million square kilometers known as the Canadian Shield. This wilderness is now covered with thick boreal forest, conifer trees and thousands of shimmering lakes teaming with numerous species of game fish that is a sport fisherman’s paradise. 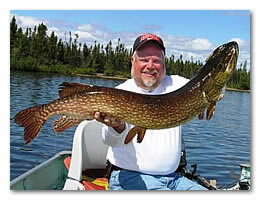 Let's travel way up north to the Canadian province of Manitoba as we welcome you to the ultimate Canadian fishing trip. This summer trip begins in Thompson, Manitoba where you will board a charter flight en route to a modern fishing lodge and some of the best sport fishing to be found anywhere. This pristine fishing paradise is located 650 miles north of Winnipeg, Manitoba on the southern fringe of the Canadian tundra. Due to the size and remoteness of these lakes, the fishing pressure is very low. Hundreds of creeks flow into the lakes with shallow bays, sheltered areas and esker points all providing outstanding habitat for northern pike, lake trout and arctic grayling. At the main lodge you will enjoy all the comforts of home and on the lake find fishing activities that are nonstop as your guide escorts you to the really hot spots on the lake. If you are the do-it-yourself kind of fisherman, then try an outpost camp that is fully-equipped for your fishing comfort with 16-foot boats with 9.9 to 15 horsepower motors, nets and depth finders. Your trip may be tailored to suit your needs in a 5 or 7-day trip and includes roundtrip charter flights, meals & accommodations. The entire staff will make every effort to make your stay in the Manitoba wilderness one that you will remember for a lifetime. For more information or to reserve a Manitoba fishing date, contact us via e-mail or call us at 1-(800)-487-0045.